TB-29s of the 500th Bomb Group on a bombing strike against Tokyo on 19 February, 1945. The bombers encountered flak and were attacked by numerous Japanese fighter aircraft - "Tonys", "Zekes", and Ki-45 "Nicks". A Kawasaki Ki-45 "Toryu" of the 53rd Sentai piloted by 2nd Lt. Osamu Hirose rammed "Z Square 12" a B-29 of the 881st Bomb Squadron. The bomber was cut in two and six parachutes were seen, although one was on fire and it collapsed. Of the five remaining crew members, only one survived. 2nd Lt. Hirose also perished, but his back seater, Corporal Kimio Kato was ejected from the a/c and survived. Most people associate B-29's with the atomic bombing of two cities in Japan. 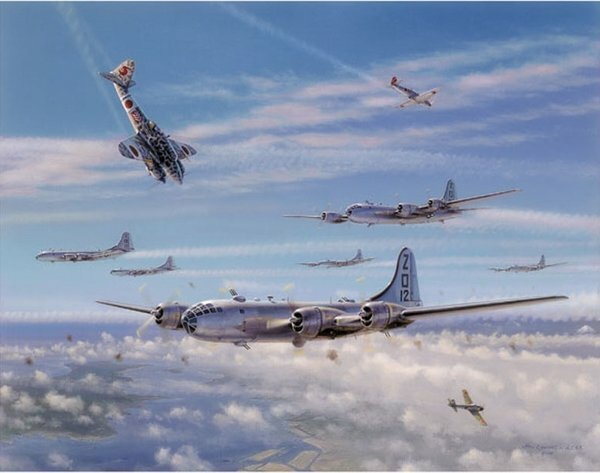 This painting shows us some of the things B-29 crews had to contend with every week - seventeen hour missions, battling flak, fighters, fatigue, weather, and 200 m.p.h. jet streams at high altitude.